When do you process and mail orders? We process orders on Saturday 08:00 (8 A.M) and mail them on Saturday 10:30 (10:30 A.M). If you place your order BEFORE Saturday 08:00 (8 A.M), your order will be mailed the same day. TIME CONVERSION CHART - orders will be processed and mailed at these times. Why did you ship to the wrong address? We never ship to the wrong address. Our shipping labels are printed directly from the data YOU ENTER. Please make sure that YOU have entered YOUR CORRECT shipping address. We are not responsible for ANY delivery delays, or missing mail, due to incorrect address data entered by the customer. Do you email order status updates? Yes, we email: order received, order processing, order dispatched (with tracking number), order on backorder, and lost password emails. If you do not receive confirmation emails from us, then they were diverted by your ISP, your spam-blocking software or by filters. We use registered mail, this requires a signature on delivery. If you are not home, then your Post Office is SUPPOSED to leave an attempted delivery notice. USPS in the USA usually does NOT do this. Once the item has been sent, BulkActives has NO CONTROL over the package delivery time. If your order is not delivered 14 days after shipping, then please contact your local post office (USPS in the USA). They WILL have your mail, don't take NO for an answer! If your local post office (USPS in the USA) refuses to locate your order, please email us and we'll initiate a Track & Trace from our post office to your post office. In many cases, a longer wait time may occur until the package has either been located and delivered, or sent back to BulkActives' return address. The buyer has the choice of purchasing Registered Airmail (NO tracking) or EMS (FULL tracking). For EMS please use the tracking number we provide to track your order. Registered mail does NOT show ANY tracking data. Note that some orders may be delayed if held by customs for additional inspection. Your Post Office has no information on specific items awaiting customs inspection. Once an item clears customs, it is handed over to your Post Office for delivery. I am in Canada, where is my order? I have recently been dealing with some issues related to orders sent via REGISTERED AIRMAIL to Canada. If you are a Canadian, I need you to understand the following, before placing an order. I do NOT work for Canada Post or the Canadian customs department (Canada Border Services Agency). Once I have shipped an order, I have no further control over what happens. 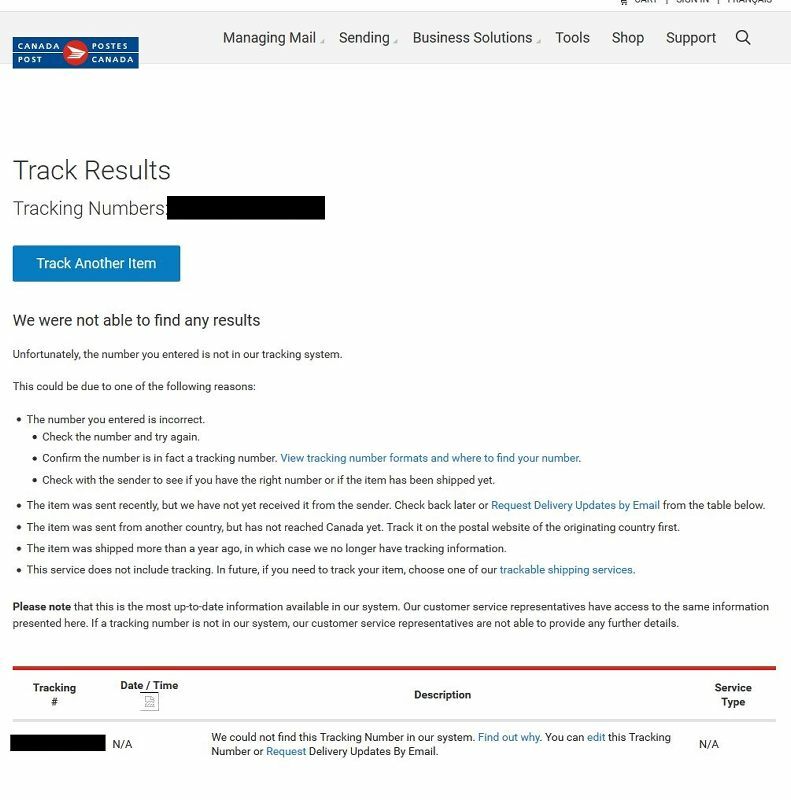 The ONLY thing I can do is to start a “Track and Trace enquiry” via my post office, but it should be noted that Canada Post will not be able to do ANYTHING with that UNTIL the Canadian customs department (Canada Border Services Agency) has released your mail to Canada Post. Canada Post does NOT have any info UNTIL they receive the mail, and they only receive the mail AFTER it has been released by the Canadian customs department (Canada Border Services Agency). This is because tracking data will ONLY appear AFTER the Canadian customs department (Canada Border Services Agency) releases the mail to Canada Post. Once the Canadian customs department (Canada Border Services Agency) has released the mail to Canada Post, the tracking site will be updated, and you will get the following message. Ifyou are unlucky and the Canadian customs department (Canada Border Services Agency) holds your mail for an inspection, then it will take the Canadian customs department (Canada Border Services Agency) about 6 weeks to clear it and release it to Canada Post. Note that BulkActives’ products comply with the Canadian customs department (Canada Border Services Agency) requirements and we have NOT had ANY mail rejected by the Canadian customs department (Canada Border Services Agency). The delay is simply because it needs to move through the Canadian customs department (Canada Border Services Agency) system. Neither I, my post office, nor Canada Post, can do anything about it! Some Canadian customers are aware of this issue with the Canadian customs department (Canada Border Services Agency), and are very understanding. Others have written aggressive letters, accusing me of poor customer service, incompetence, and/or fraud. Again, I do NOT work for Canada Post or the Canadian customs department (Canada Border Services Agency). Once I have shipped an order, I have no further control over what happens. Please understand and accept the process, before ordering! This process is the same for ALL countries, but luckily most countries do NOT have any problems or delays. Recently the Canadian customs department (Canada Border Services Agency) have been slow. Italian customs has always been slow . South African customs AND South African Post are slow. I WILL process your order on Saturdays and post it on Mondays. 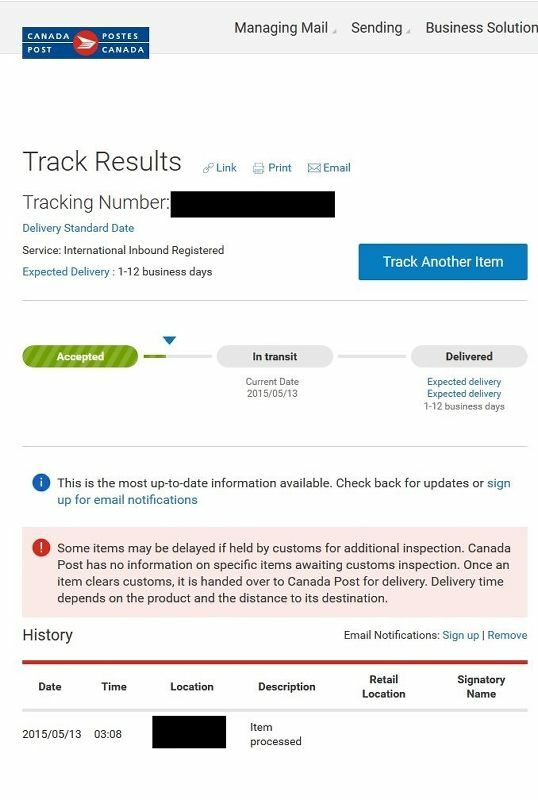 I WILL initiate a “Track and Trace enquiry,” if you have not received you order with 21 days (sent me an email), BUT note that Canada Post will not be able to do ANYTHING with that UNTIL the Canadian customs department (Canada Border Services Agency) has released your mail to Canada Post. I will ONLY issue a refund for the products, but NOT the shipping costs, if YOU refuse delivery OR if you fail to arrange clearance with the Canadian customs department (Canada Border Services Agency), if requested to do so by the Canadian customs department (Canada Border Services Agency), and your order is retuned to me. UPDATE: I NO longer offer Registered Airmail to Canada. The only options is EMS. Regrettably, There are STILL customers who either do not read, or chose to ignore, the warnings and explanations I have provided (FAQ and Delivery Info) and insist on holding me responsible for the inadequate and slow service provided by the Canadian Postal Service and Border Control Agency (Customs). EMS has full tracking, is more easily traced, and does not seem to be affected, as much, by the bureaucratic incompetence and apathy of the Canadian Postal Service and Border Control Bureau. What are your shipping (postage) charges? Shipping costs are calculated automatically by our shopping cart. International shipping charges are based upon the package weight and the location, as determined by TPS, using PayPal's international exchange rates. International EMS (4-7 days delivery, TRACKING) - Note that EMS is cost effective for LARGE orders only. Yes, EMS mail has full tracking. Registered mail ONLY shows limited data. USPS does NOT offer tracking for registered mail anymore. Note that some orders may be delayed if held by customs for additional inspection. Your Post Office has no information on specific items awaiting customs inspection. Once an item clears customs, it is handed over to your Post Office for delivery, at that stage they will be be able to add your mail to their system, and data will show on their tracking website. America: USPS does NOT offer tracking for registered mail anymore. Should I choose small packet airmail or EMS? It depends, at a certain weight it becomes much cheaper to use EMS, also EMS has TRACKING. Registered Airmial does NOT have tracking. Our shopping cart will allow you to estimate the shipping costs. We request that you contact your customs office and ask about import regulations and restrictions before placing your order. It is important for you to become familiar with Customs policies for your specific country before ordering. Customs regulations differ by country and not knowing their regulations can result in your order incurring high import duties, the delivery being delayed or even returned. Please check with your Customs office to see if your country permits the shipment of the products you are planning to order from us and if any additional licenses or permits are needed. You may have to pay import taxes and/or customs duties. You may also be required to pay a brokerage (handling) fee for the shipment. These charges are separate from your shipping charge and you will be billed directly for them. Registred mail ONLY shows limited data. Note that some orders may be delayed if held by customs for additional inspection. Your Post Office has no information on specific items awaiting customs inspection. Once an item clears customs, it is handed over to your Post Office for delivery, at that stage they will be be able to add your mail to ttheir system, and data will show on their tracking website. My products were damaged, what can you do for me? We used to have a problem with the seakelp jars leaking due to cracks. We are now using much stronger jars and this does NOT happen anymore. When a bag of powder has burst we'll replace the lost portion of that product. Email us the details of the loss. If there is a small hole in the side of the bag it usually means that your customs agents have taken out a small sample for inspection. What happens if my mail is returned to you? the mail carrier attempted delivery while you were not home and did NOT leave a note in your mailbox. No matter what...when we receive the mail we will issue you a ful refund for the products, but NOT the shipping costs. Will you mail products to my country? If you can pay us via PayPal, then we will ship to your country. Mailing products to Greece or Italy is not easy as their customs are very restricted. We do mail to customers who live in Greece or Italy, but we cannot guarantee that your customs department will issue clearance. We generally do NOT recommend that you purchase our products. However, if you accept these risks, feel free to place an order. If your customs department returns the product to us we WILL issue you a refund for the cost of the products (but NOT the postage costs). It can usually take up to 3 months for customs to process mail. During this time you will not know the status of your mail as the customs department does not provide tracking data to your post office (more on that here). If we don't receive the product back, you will not receive a refund. USPS does NOT offer tracking for registered mail anymore.